This year I'm trying to explore some new flavors I usually don't use in my cooking. 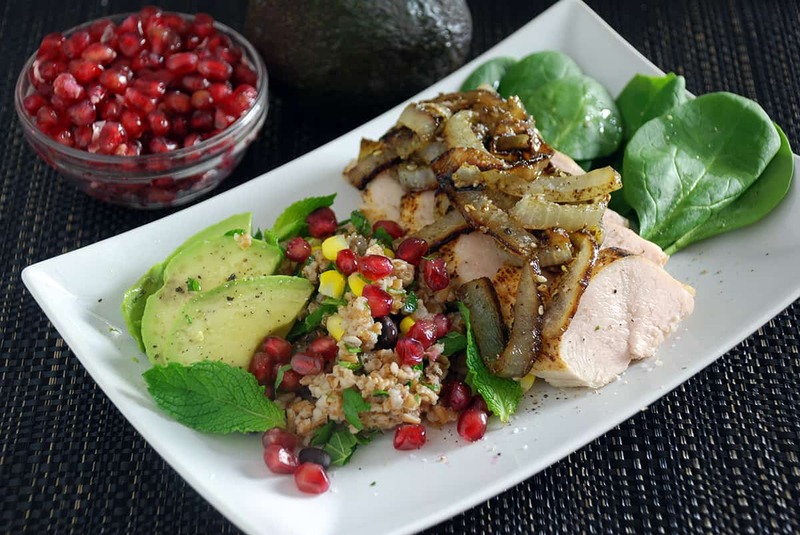 For this recipe I go in a Middle Eastern direction and combine a sous vide chicken breast with some za'atar onions and a bulgur wheat and pomegranate salad. It's a really flavorful but light dish with lots of different textures and tastes. Za'atar is a classic Middle Eastern spice blend of thyme, toasted sesame seeds and sumac. It adds a complex flavor that complements the charred sweet onions. I'll often make extras since it lasts for a week or so in the refrigerator. Below I give a recipe for making your own but you can often buy pre-made mixes that will work just fine. Bulgur, or bulgur wheat, is another common Middle Eastern ingredient and it adds a great base texture and holds the salad together. The corn and pomegranates both add bursts of sweetness and flavor while the mint and parsley contribute wonderful herb notes. This dish can be served hot or cold, whichever you prefer. All of the ingredients can be stored in the refrigerator overnight if you are serving it cold. If it's going to be served cold, make sure you use a little more seasoning than you would normally so it still comes through. I like to finish the dish with some sea salt and walnut oil, but you can just use olive oil if it's all you have on hand. I prefer my chicken breasts cooked at 141°F (60.6°C) for 2 to 4 hours since it seems to be the ideal temperature for tender and moist chicken that still has that "properly cooked" texture and feel. You can cook chicken safely as low as 136°F (57.8°C) but then they are a little too raw-tasting for me. Some people prefer them as high as 147°F (63.9°C) but I find them a little too dry for my taste. If you are curious about the various pasteurization times for chicken you can view them on my sous vide thickness ruler but here are some for 141°F (60.6°C), my favorite white meat temperature. A thickness of 1/2" (13mm) takes 40 minutes, 1" (25mm) takes 1:10 and 1.5" (38mm) takes 2 hours. Those are the minimum times needed to make the chicken safe, but the texture is still good for up to 4 hours or so. In this recipe I call for a sear on the chicken breast but I know it can be hard to get any browning on chicken without over cooking it. I've skipped the sear before and an unseared chicken breast also works really well. If you would like more information about the modernist techniques, ingredients, and equipment used in the sous vide chicken breast recipe with bulgur salad and za'atar onions you can check out the following. Preheat a water bath to 141°F (60.5°C). Lightly salt and pepper the chicken then sprinkle with the garlic powder. Place the chicken breasts in a single layer in a sous vide bag, add the thyme, then seal. Cook the chicken breasts for 2 to 4 hours.For more information on the cooking times you can read my detailed article which addresses why is there a range in sous vide cooking times. Heat a pan with no oil in it over medium-low heat. Add the sesame seeds and cook the seeds until they just start to brown and become aromatic, usually after 2 to 5 minutes. Remove the sesame seeds from the heat. Combine the sesame seeds, thyme leaves and ground sumac together in a small bowl and mix well. Remove the skin from the onions and slice into rounds about 1/2" thick (12mm). Heat the canola oil over medium-high heat then add the onion rounds in a single layer. Let the rounds sit until they begin to brown then flip them. Sprinkle with half of the za'atar seasoning. Let the onion rounds continue to cook until the other side starts to brown. Add the remaining za'atar seasoning and stir to mix in the seasoning. Salt and pepper to taste then continue cooking until the onions are tender. Remove from the heat and set aside. Add the cooked bulgur wheat, corn kernels, black beans to a bowl and mix well to combine. Stir in the pomegranate seeds, parsley and mint. Salt and pepper to taste. The salad can be held for an hour on the counter, or a day in the fridge before being used. Remove the cooked chicken breast from the sous vide bag and pat dry. Lightly salt the outside then quickly sear it until the chicken is just browned. Cut the chicken into slices. Place some spinach on a plate and top with several chicken slices. 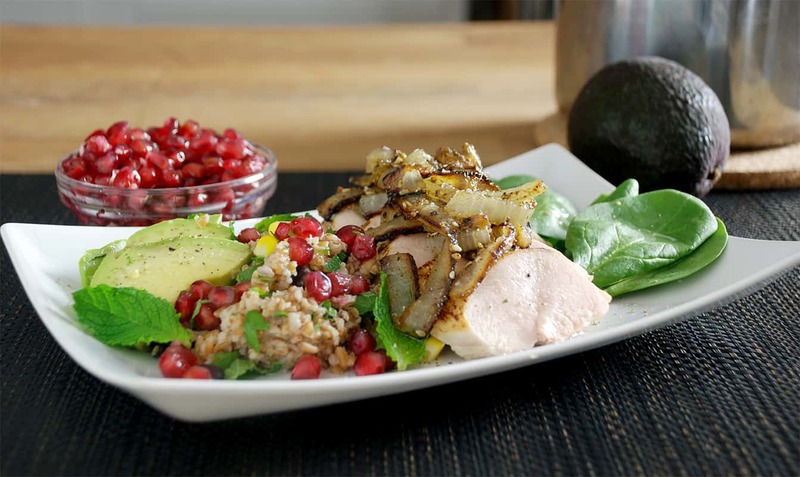 Add a spoonful of the bulgur wheat salad to the side as well as a few slices of avocado. Top the chicken with the za'atar onions. Drizzle some walnut oil over the top and sprinkle with some of the finishing salt then serve. 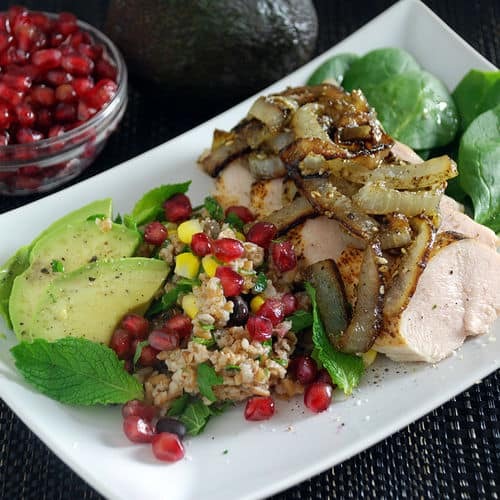 A tender and moist sous vide chicken breast recipe combined with a bulgur wheat and pomegranate salad topped with a homemade za'atar seasoning and browned onions is a light and flavorful dish.